R. Kassman will be closed from April 9th-17th, please visit us on April 8th for our Spring Clearance Sale! Thanks to modern innovations, your piano is capable of performing any of the functions of an old fashioned player piano and a modern digital piano without trading the feel of a real keyboard. With the right digital player system and accessories, you can connect your piano to an array of MIDI devices, iPods, iPads, Android phones, personal computers, and the Internet, then have it play automatically from a stored library or run it through a digital recording program, or put on a set of headphones at 2AM and play to your heart's content. At R. KASSMAN, we offer a variety of electronic piano systems, such as Yamaha's Disklavier, PianoDisc, and QRS, along with all of the accessories you need to meet your listening or performing needs. 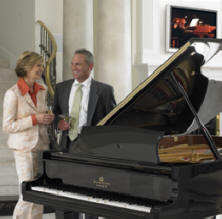 Contact R. KASSMAN today to find out more about our selection of player piano systems and accessories. We are proud to feature Steingraeber, Grotrian, Sauter, Estonia, Schulze-Pollman, Baldwin, Kayserburg, Brodmann and Ritmuller pianos, and refurbished and used pianos from Steinway, C. Bechstein, Yamaha, Kawai Bosendorfer, Schimel and Mason Hamlin. Explore a sampling of our fine upright and grand pianos HERE on our website, or make an appointment to visit our showroom to play them. The best piano value is waiting for you at R.KASSMAN’s Bay Area Piano store, located in Berkeley CA and convenient to San Francisco, Oakland, San Jose, Marin County, Sacramento, and Santa Rosa California.